All of the kids arrived safely before the Kansas snowstorm hit! The snowfall was the most snow we have seen in Kansas so far! It covered the ground and streets with a beautiful white blanket on Saturday morning. We all stayed home and enjoyed a relaxing day together. Ryan and Katie arrived on Christmas Eve. We went to a candlelit service at our new church and then came home and had our Christmas dinner together. Ryan will be continuing his studies at the Nazarene Theological Seminary in Christian Education. He will be in his second year. He took a few months off and worked full time at a bank while Katie finished up her degree with student teaching. Katie is looking for a music teaching job. She is certified to teach pre-k thru 12th grade. They live in an adorable town home in Olathe, KS. It is nice to have them so close by. 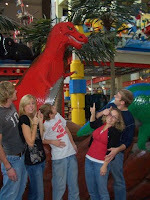 In November, we all enjoyed seeing Ryan's childhood smile as he walked with Katie through Lego Land in the Mall of America, Katie's first trip there. Jacob is in his junior year at Northwestern College. He happily left the "dorm" lifestyle and moved into a nice condo with a group of buddies. He is working towards a degree in psychology. He plays free safety on the football team at Northwestern. He earned second team all conference even though he broke his hand. He missed two games due to his injury and played two with a padded hard cast ! He would like to work for the FBI someday. He and Kari (his girlfriend) spend any free time together. We actually were very blessed to have Kari live with us this past summer. We all enjoyed having her here with us. Amanda is a senior at Hillcrest Academy. This past summer she worked two jobs! She was a certified lifeguard at a local water park and worked as a retail associate. She ended up saving two children at the pool! One was during her very first shift and one was the last day of work for the summer. At school, she played midfield and forward for the Hillcrest soccer team where her speed and quickness paid off. She continues to work hard in everything she does. She loves to be creative and has enjoyed being the class vice president for the student body were she has had plenty of opportunity to put her ideas to work(welcome party, homecoming coordinator, Fall Festival, and the Christmas banquet so far)! She has an eye for things and continues to be a great fashion advisor! She loves to shop and looks for any excuse to go to the mall! Grant is a freshman this year. He also attends Hillcrest Academy in Fergus Falls, MN. He quickly adjusted to the new dorm life, finding new friends, doing his own laundry (fortunately his sister has helped with that one!) among other things....he must be a military child!! He continues to love playing football and basketball. He actually had the opportunity to start for several varsity football games. He is on the JV basketball team and was excited to be able to "dress" for a recent varsity game. He likes living in Mn and has made a few trips to Minneapolis to see his brother Jake. On one of his trips, he and Jake's buddies ran into Adrian Peterson (running back for the MN Vikings) at the Mall of America! Shawn is working as the Director for Strategic Communications (Stratcom) at Ft. Leavenworth, KS. He has a busy schedule which includes a lot of travel where he continues to brush shoulders with some amazing people including President Bush! Over Veteran's Day weekend, he had a wonderful time sharing his experiences in Iraq with a standing room only group of men at Bethel Church in Fergus Falls. His eyes still light up when he gets a chance to talk about all that our brave men and women are doing in Iraq and elsewhere in the world. Since his return from Iraq, he has started early morning running with Amy. He enjoyed being back home and the ability to travel to MN to see the kids events instead of trying to listen to them over the Internet or by getting a play by play from Amy at 2:00 am Iraq time! Amy is adjusting to an empty nest. She misses the bustle of the kids at home. She is still working at the Basehor Sixth Grade Center which gives her a kid fix! She serves as the "lunch lady, nurse, encourager, secretary, and building administrator. Sounds a lot like being a mother! She continues to decorate and redecorate our home especially during the Holiday Season. Amy still loves the early morning runs and relaxing on the couch with a hot cup of tea at the end of the day. She also loves getting dressed up and attending the various social events associated with being an Army wife! As we look back on this past year, we are filled with amazement and wonder. Amazed at God's strengthening of our family in spite of the many miles of separation and periods of stress any Army family endures. For that, we look with wonder to what God has in store for us this next year. Seven months of marriage, we're practically pros! We have finally settled into our little townhouse and are loving it. The construction work throughout our complex has finally come to an end and the renovations are great. We even have room for a guest (for a small fee :) )! Katie has been busy finishing up her degree in Vocal Music Education at MidAmerica Nazarene University. Student teaching has been a rewarding finish to her education. Katie is now in the process of finding a teaching position. She has her heart set on elementary music, we'll see where God leads us. Ryan is currently bringing home the bacon from his job at Security Savings Bank, which is only a five minute drive from the house. He has enjoyed a hiatus from his graduate program in Christian Education, but is excited to resume his program this spring. We look forward to spending our first Christmas together! Our two little ones are growing up fast..for all you empty nesters out there, you know what I mean..cherish them always!! 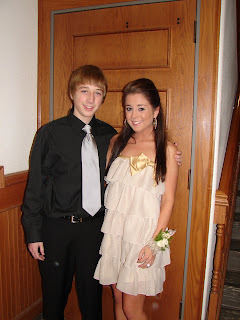 In case you are wondering, they each had their own date!! Two days of rain and ice slowed everyone down in the Kansas City area. Amy enjoyed two days off from work while Shawn had one delayed start for work. Amy was able to clean, bake Christmas cookies and do some long overdue grocery shopping! It was a real treat for her to catch up on a few things at home. As Amy and I snuggle by the fire next to Dallas and Rudy, we are reminded of just how wonderful it is to be together this year. 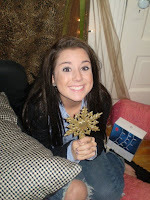 Last year I was in Iraq and spent Christmas in Baghdad, while Amy held down the homefront. Therefore, we rejoice in being together and doing all the fun things associated with this time of year... the celebration of the birth of Immanuel... God with us! We thought it would be fun this year to do something different than write the same old Christmas letter and instead come into the 21st Century and do a Christmas blog to share all the Stroud Family blessings of this past year. Over the weeks leading up to Christmas we will attempt to capture in our own words the wonderful journey God brought us through in 2007, a year of blessings! In the unforgettable words of Jed and Ellie Mae Clampett, "Ya'll come back now you here!"